In the famous Peanuts cartoon, Charlie Brown is running to kick the football, when Lucy pulls it up, and Charlie kicks at air, falling down. Every time, he thinks the result will be different, and every time, he is wrong. That is the famous definition of insanity. So maybe I am insane. I’m getting better, but it has taken me a long, long time to do so, because I still kick at air. Last summer, I got a call from a younger alumnus from a canoe tripping camp that I attended in the ‘60s, both of us going to the camp’s reunion in August. There was a special request to create a special endowment for this centennial year, and I planned to give. I thought that was obvious, since I give financial support to young people who cannot afford the camp’s fees. Yes, fifty years ago, I was in a select group of canoe trippers that canoed Temagami Provincial Park in northern Ontario. It was a difficult trip; I still remember my knees hurting from kneeling in the bow in 2-3 foot waves. We were never allowed to sit in the bow seat. We knelt. In the stern, the staff man sat. To this day, if I am in the bow of a canoe, I kneel. Every day on that trip it rained, but it was a good trip. We saw remote country, and while I never will see Temagami again, the memories of places called Lady Evelyn, Ostergut, Makobe, and Fat Man’s Misery Portage are part of me. I have trod that country. The caller was interested in my subsequent canoeing experience, and I gave him a brief rundown of my outdoor water resume: the Nahanni, the upper Yukon Basin from Lake Bennett to Carmacks, the Alatna and Noatak Rivers in Alaska, and 32 years canoeing the Boundary Waters-Quetico. I have been blessed. The caller had canoed Labrador, which I thought cool, but he especially wanted to see my Nahanni pictures, a trip he had always wanted to do. Yep, sooner or later, it came to money, and I told him I would contribute, as I had planned to. The conversation ended soon afterwards, and I felt a little used, but hey, maybe he was busy, and we would learn at the reunion about each other’s trips. Maybe. These things almost never pan out: the call was about money, interspersed with feigned interest of what I had done. People seldom call me curious about what I’ve done. The calls are usually about money or medical advice. I arrived a day early for the reunion in late August, back on a lake where I spent 6 summers, and I got to see the island, 46 years later, with relatively few people present. The next day, the rest arrived; I was present at the dock where they came in. I heard the name called of the individual who had phoned me, and I went over to introduce myself. He greeted me semi-warmly then saw somebody else he knew and disappeared. For good. The football had been pulled up. I had the Nahanni slides with me, for we took slides in 1985. I had lost the roll of film, wrote Parks Canada, saying it might be in the campground at Fort Simpson, where we had stayed on our last night. Incredibly, six weeks later, the roll was sent to me. Canadians do those sorts of things. I had pictures of a remarkable area very few people will ever see. After arriving at Fort Simpson, we flew to the Nahanni in a Twin Otter with 6 people and 3 canoes, landing on a sandbar. The Nahanni was a difficult trip through Class III rapids, the worst mosquitoes I have ever seen—and I have seen more than most— but I saw the highest waterfall, Virginia Falls, in North America. I paddled through four canyons almost as deep as the Grand Canyon itself, sat in some natural hot springs, came out on the Liard River and saw the great Mackenzie. The Nahanni was pure wilderness. It is the crown jewel of my outdoor water resume. 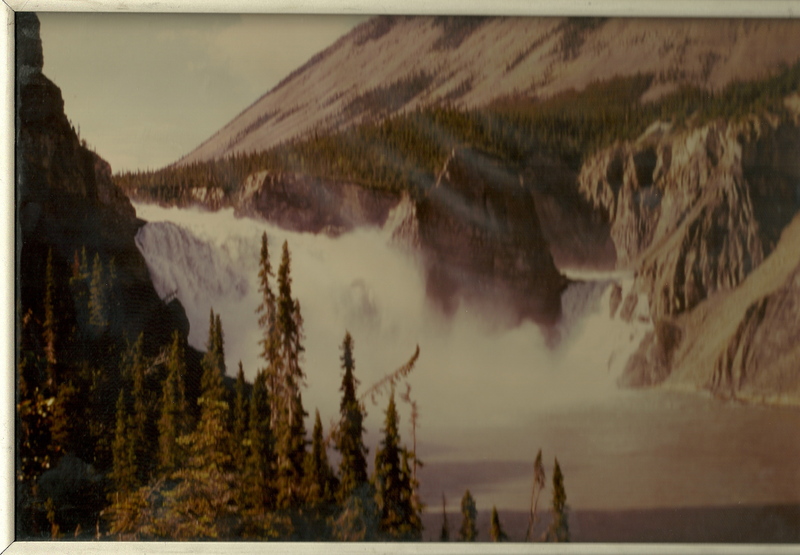 Virginia Falls, South Nahanni River, NWT, July, 1985. I should have known better than to bring the slides. Getting money from me was the issue, not what I did or who I was. I’ve felt that way a lot, these past 16 years, after I left medicine. I give on my own terms to those I wish. I do what I can, hope to make a difference, and wish some day one of my ideas will be accepted, improved, and have a significant impact. I had many such ideas in medicine. My wish to be a busier volunteer in the public schools has yet to be granted. We ought to have paid universal mandatory national service, which would give young people a sense of purpose and direction, lessening the likelihood of student debt catastrophes. We ought to be saving water every way possible. We should ban companion animal breeding. I have written about all of these in this blog. We should have had incremental single payer medical care, starting with the very young. This would have been easier, cheaper, and less likely to have been voted against. We should have tracked a whole host of quality issues in medicine. We need free, unbiased, end-of-life counseling to elderly people to help them understand what “all those tubes” mean, and what their options are. By ignoring the elderly, we ignore elders, wasting resources I can’t begin to fathom. In short, we need incremental changes, keeping both the enemies of change and the perfectionists at bay. I wish I hadn’t brought the pictures of the Nahanni back up to the country where they were taken. I knew he would not be interested, but I persevered, hoping, like Charlie Brown, it would matter. People are busy, too busy for guys like me. I tried to travel light, and those pictures and his call were excess baggage. But I was lucky. I have seen the Nahanni, drunk the water, know what’s out there. There is no blank spot on my map. While it’s on my resume, far more importantly, it is in my brain. I can call it up any time I want: the magnificent falls, Fourth through First Canyons, Pulpit Rock, and the Gate. Wow. I was there! I got back up to the camp one last time, and I don’t ever need to go again. I have taken my last look. Yeah, the football was pulled up, but I had a soft landing. It was his loss, not mine. That line is in Peanuts, too. This entry was posted on July 4, 2014 at 10:16 and is filed under GENERAL STUFF, MY WRITING, UNPUBLISHED OUTDOOR WRITING. You can follow any responses to this entry through the RSS 2.0 feed. You can leave a response, or trackback from your own site.